Customers do say the dumbest things, and this hilarious book contains a whole host of crass, stupid and just plain odd requests and queries heard on the high street. Featuring laugh out loud remarks from coffee shops and supermarkets to bars and bookshops, read safely in the knowledge that you would never make the same embarrassing errors (would you? ), as The Customer's Always Wrong illustrates just how silly people can be. The perfect stocking filler for Christmas 2013. 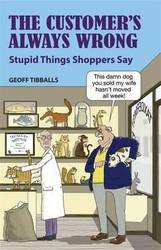 Geoff Tibballs is the author of many bestselling books. His other titles for Michael O'Mara Books include Crap Teams, The Seniors' Survival Guide: New Tricks for Old Dogs, Senior Jokes (The Ones You Can Remember) and No-Balls and Googlies.